Hey there! Pinterest is always on hype due to the massive blog traffic it sends as a referral. Yes, 90% of bloggers claim to have the highest referral traffic from Pinterest (including me :)). You can find several Pinterest tips for business and how to have traffic from pinterest. 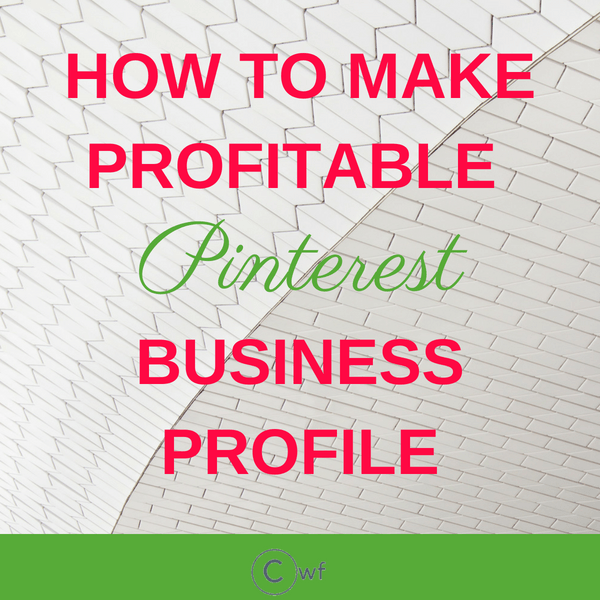 So, let’s not waste any time and start building your awesome Pinterest Profile. If you treat your blog as a business then DEFINITELY you have to change it to a business account. A business account will provide you with a feature called ‘Analytics’ and it is immensely useful. With the analytics data, you can see which Pin is performing well and which one is not gaining traction. So you can change your wording or graphic for the poorer performing Pins accordingly. 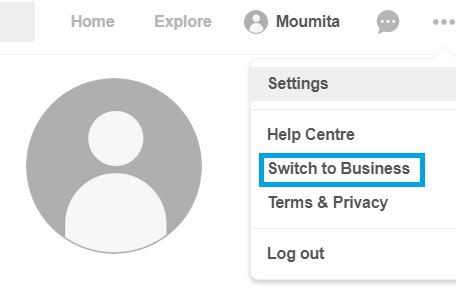 The business account is Free 🙂 Go to your account and click on your profile picture. Yes, a direct link is given there. You need to provide your business name and business type. I have put it as Cool Web Fun as my Business name and definitely a blogger as a business type. It’s DONE!. Yes, it was that simple. Just simple. 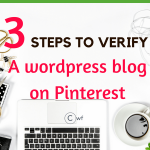 The next step should be verifying your website on Pinterest. Do you know by verifying your Pinterest Profile in WordPress or any other blogging platform, you’ll get a backlink for free. Yes, it is worthy as Pinterest is having high PR (PR9) with a global rank of 30. Backlinks are the foundations of page ranking system in search engines. It will also help you to get visibility in search engines. Here is how to get 16 social media backlinks for your blog. The easiest way to verify website with Pinterest is by using Yoast SEO plugin. This plugin is just a must for many other utility features. Click on the gear of your Pinterest profile and go to settings. Copy the Meta tag and DO NOT CLICK on the finish button. 2: Move to WordPress dashboard>Yoast SEO. Paste your metadata here and save changes. 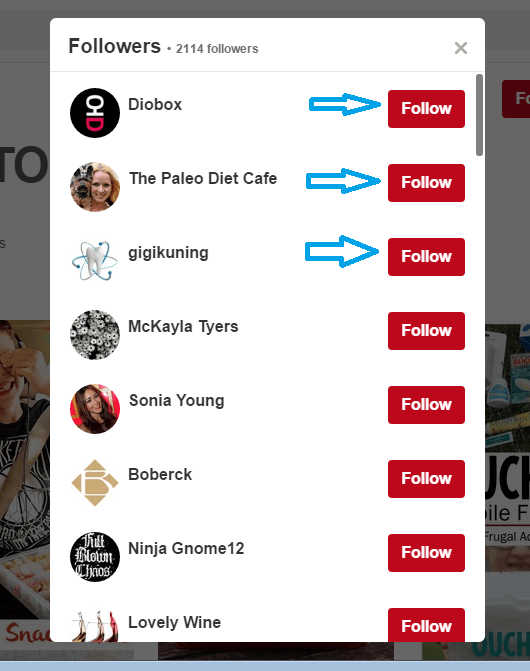 3: Move back to your Pinterest Profile and click on the red finish button. If you do not wish to use Yoast SEO plugin (though I highly recommend it) then I have a whole blog post on how to confirm website on pinterest which includes all the possible ways of verification apart from Yoast Seo. Let’s now activate the rich pins which make our pins look more beautiful. Before activating a rich pin first know how will a rich pin help you? Rich Pins add your website information with the Pin such as your blog title and website name. The best part is when you update your blog information, the rich pin gets updated automatically. I just love this feature. Secondly, rich pins are of 4 types Article Pins, Product Pins, Recipe pins and the App pins. So depending on your site you can choose accordingly. To activate rich pins click on the rich pins validator. Enter any of your blog post URL & validate. Once your Rich Pins are validated you will receive a confirmation from Pinterest shortly. Your profile name should contain the keywords of your business purpose. Business Purpose.. Right? You are blogging with a business in mind. Whether you are running a yummy recipe blog, exciting adventurous, gorgeous home decor or what so ever you are pretty passionate about, just include those keywords in your profile name. In the description be very clear about what your blog is all about. Do not leave it to people to find out what you do. All are very busy in general, so people will not give them time to know you until you are straightforwardly saying your purpose. Look at the profile name. All are rich keywords. It defines her purpose of blogging from very first looks. She is not making anyone confused about what service she provides. If somebody searches for Pinterest marketing, her profile will show up and even her pins will be displayed. Now check the description she has given. Pinterest management, Pinterest marketing tips, Pinterest planner, all are keywords used beautifully. Blogging, Social Media, Entrepreneurship all are keywords. Her description even gives a clear message of her blogging purpose. Same goes for your boards as well. Pinterest is a search engine so keyword plays a vital role here. Include all the appropriate keywords related to your boards. When you put the right keywords then Pinterest displays your boards as well as the pins in it, when someone searches for those keywords. Here comes the most attractive visual part of the visual search engine. What makes you click or save a pin? The color combinations used its graphic elements, the wordings. You have to make your pin stand out in the crowd with its visual attraction. You can make beautiful images for Free in Canva. Though Canva also has a paid option, the free option is also worthy of. I am sure you already know about it. The second is a paid option but the customization you can do here is incredible. It is Pic Monkey. If you are already having your brand in place then I would highly recommend using Pic Monkey. Not only it is simple but it will also make your brand stand out. Initially, you have to do trial and error to see which of your pins are going well with your niche audience. Once you figure it out then it will be a lot easier to make perfect pins in the long run. Pinterest is always playing with its algorithm. Recently it has taken up its descriptions in rich pins. But when someone searches for relevant pins in Pinterest, then the description is the only place filled with keywords which helps the PIN to show up in searches. Preferably use 2-3 phrases of meaningful keywords. Check the example above. A meaningful description is used with 3-4 rich keywords. It has high chances that Pinterest will always feature this Pin whenever someone searches for blog traffic or growing their blog. You have to be strategic my friend. You have to have a certain format of your pinning. Whether its 20/80 rule or 50/50, with manual pinning or with the help of any scheduler. You have to have a schedule and make a commitment to doing it daily. Currently, I am using manual pinning. But while writing this post I was using tailwind . Now tailwind gave me some extraordinary results in monthly views of Pinterest. I literally reached from 17000 to 1,40,000 page views for Pinterest in less than 2 months. Now you may ask why did I shift to manual pinning then? Well, this is for Carly’s Pinteresting Strategies. I am really astonished that how can someone dig so deep with Pinterest. Yes, I am following her strategies right now. The book costs only 32$ so if I would not be highly recommending it then I would not have mentioned here. Another MIND BLOWING strategy which I have gone through is Scrivs Billionaire Pinterest. Though it is pricey but worth every and every penny of it. This is not only a Pinterest strategy. It includes everything you can ever need in your blogging journey. I really wish I could have come across BBC when I just started with blogging. It offers a 12 Day blogging bootcamp for free, that is also stuffed with so and so much valuable info. Whatever strategy you want to try, just keep on doing it consistently as without consistency you cannot win it. Pinterest is a search engine. Yes, a visual search engine for sure. In fact, nowadays I have literally shifted my searches from Google to Pinterest for most of the queries. But Pinterest works like other social media too, where you can follow others and there are high chances to get back the follows as a reply. So, if you follow your niche related people, most of them will follow you too. This method will work even if you have zero followers. This method is good only if you are just starting out and really need some followers to make your profile look lively. Though I have never practiced it. I have always followed people whose pins I loved and wanted to see in my feed. 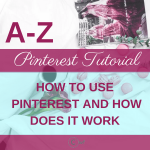 For the ease of re-pins (Yes re-pin is necessary for Pinterest Success). Let me assume you are having zero followers and your niche topic is automobile repairing. Automobile repairing is not only a niche but a micro niche topic. I am choosing this topic to clarify that you can build your niche followers by this process, just for any niche you want to. 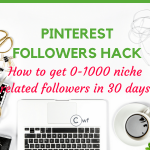 Let us check out how to get a lot of followers and how to get a friend on Pinterest with common interests. 1. Go to Pinterest.com and log in. 2. Click on the search button and type Automobile Repairing and click on Boards. 3. Here you will get thousands of boards on your topic. 4. Click on any board you like. 5. I have chosen automobile repair as it was the first option displayed and it is having a fair amount of 2.1k followers which can be your followers too. 6. Click on the followers. The followers who are following this board are having interest in automobile repairing. So If you follow them they are likely to follow your board too when they will check your board also contains automobile repairing related pins. 7. Just follow as many you can. Daily have a target of following 50 people related to your niche site. 8. Will all of them follow you? NO. But 50-60% will. And that is how you will get your niche oriented genuine followers. 9. If you do this even for a month then 50*30 days=1500 niche related followers you will get. 10. You can continue doing this until you are having a satisfied number of followers for your blog. This is a small step which you should take outside your Pinterest profile. Make your blog super optimized for Pinterest. 1. Always provide a pinnable image in your blog posts. 2. Have a ‘Pin it Hover button’ on your pinnable images. You can install the Pinterest Widgets plugin if you are using WordPress. 3. Have 3-4 images pinnable images for your blog posts to pin alternatively on Pinterest. If a 3-4 pinnable image is making your post look dull then you can always hide it within your posts. Check it how to hide images in a post. Okay!! 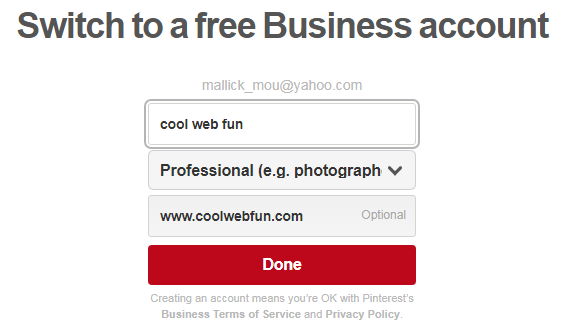 So now your Pinterest for a business profile is all ready to rock! ← How to easily add Custom Thumbnail to YouTube? Been wanting to start monetizing my Pinterest for awhile and now you really got me into it! Definitely Monetize it. And think of your blog as a business if you really want to succeed. If you are thinking to use Pinterest for your blog traffic then do make the profile professional at first place. Thank you so much for this! I need to start using Pinterest more often. This is helpful! I really needed this tutorial! It has some great information and I can’t wait to put some of your suggestions into place! What a great guide for a Pinterest noob like me. I have read of many people having blog success using Pinterest. Your guide seems like a good starting point for me to get into the game! This will come in handy for me. I have a Pinterest account that I don’t really use that much, but want to start using more. These tips will come in handy! If you are blogging for business then definitely set up your Pinterest account like your resume. excellent Article, Thank you for this information.